Note: This is not a new function but the old post got archived meaning no one can reply, so now you can reply here if you need help. A script that combines many uses of the AutoHotkey ImageSearch command into one powerful and easy-to-use function. I apologize, the documentation trails off in a few parts, I never got around to finishing it. But just ask here if you have any questions! Last edited by berban on 15 Mar 2019, 10:49, edited 7 times in total. awesome work you did there! Unluckily I am still getting the GDI+ error. Do I have to download and install the GDI+ module somewhere first? I hoped it was somehow included in windows. I got the very same issue. Have the problem been fixed yet? All set! After an hour of poring over the code I finally found the one typo that was causing all the issues. Too bad it wasn't anything more fun. Thanks for being patient! berban wrote: All set! After an hour of poring over the code I finally found the one typo that was causing all the issues. Too bad it wasn't anything more fun. Thanks for being patient! Thank you very much for fixing it so fast! Will try it out and reply if there is something else not working properly! Also is there a way to go back into the image creating menu when you are in the FindClick Debugger window? Another thought, it would be great if the image creator tool would take the path you chose the last time as the default path. I assume though, that this possibility would only be possible with an extra config file. And I could totally understand if you don't want that. If you do though, there is another option I personally would apprecciate that could be realized with an extra config file. It would be great, if the 'FindClick Screenshot Creater' wouldn't always open in the middle of my main screen. Would be cool if your tool would save the last position of the window and reopens it there the next time. Cause right now I open it and always have to move it aside. Hey Remonell! I made a minor update to address some of your issues. Remonell wrote: When I create a png with your tool, and right after that click on 'Test', I assume that it searches for that just created png anywhere on my 2 monitors. Unluckily it does not find it in the test, although it does find it with my script and my ImageSearch function. And the image that is to be found is open on my main desktop in an open window. You are indeed right, the script will search on both your monitors for the image. In your screenshot you'll see it says "Search #1" ... "Search #2": those indicate search on your first monitor and then the second. (When you click on those entries the monitor it searches will be shaded red.) I don't have a ready explanation for why it didn't find the image, although one common issue is that the image is a button or something that changes appearance when your mouse hovers over it. Since the capture rectangle follows the mouse, you may have captured it in this state and when you click on "Test" you are no longer hovering over it and its appearance has changed. To work around this issue, make sure the "Allow Offset" box is checked in the image creator gui. Then pause the updater by pressing the backtick (`) key, move the mouse a little, and unpause it. This allows you to capture an image that isn't directly under the mouse. 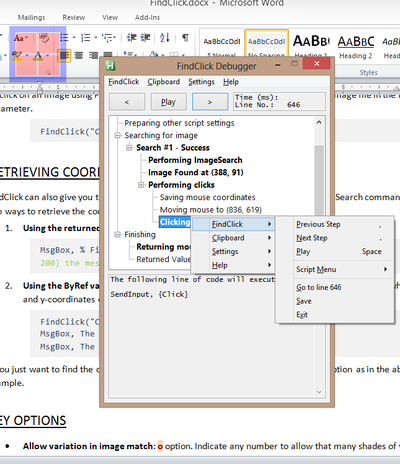 Remonell wrote: When I am in the FindClick Debugger and I click on Settings -> Edit Debugger Settings it gives me a error message. Remonell wrote: Also is there a way to go back into the image creating menu when you are in the FindClick Debugger window? If you close the debugger window (or press esc) it will return to the image creating window. But no unfortunately you can't switch back and forth between them if that's what you mean. Remonell wrote: Another thought, it would be great if the image creator tool would take the path you chose the last time as the default path. You're right I didn't want to have any config files, but you can set some "favorite folders" by changing the variable "DefaultDirs" located on line 12 of the script. These folders will populate the dropdown list in the image creator save box, and you can quickly jump through them by pressing up and down. An added bonus is that you can also search for any images in the "DefaultDirs" without putting the full path. For instance, if "image1.png" is located in one of those folders you only need to say FindClick("image1.png"), or FindClick("image1") because png/bmp is assumed. Remonell wrote: It would be great, if the 'FindClick Screenshot Creater' wouldn't always open in the middle of my main screen. I just added a setting you can change inside the script settings. Go to the image creator settings and on line 1277 of the code you can edit GuiX = and GuiY = . Put in some number to have the gui first appear at these coordinates. Let me know if you have any issues with any of that. This has incredible polish and It made one of my latest projects a breeze. Thank you. Thanks for the kind words! 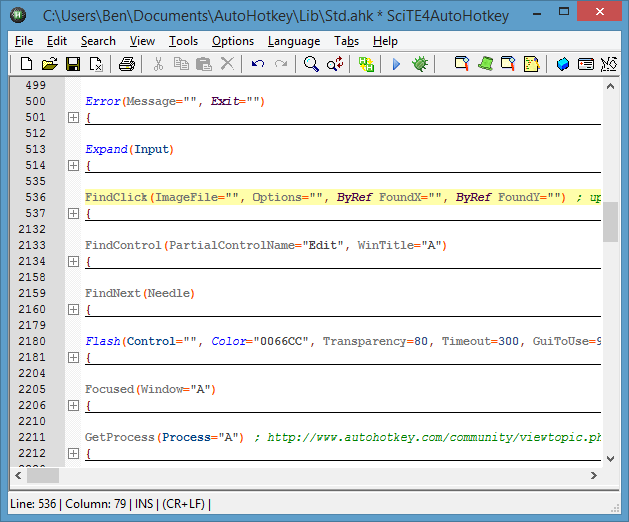 To be honest, I've hardly done any work with AutoHotkey objects and I don't really use AutoHotkey or code in general too much anymore so I don't think I'll be making a major change like that anytime soon (but if someone else wants to tackle it be my guest.) But I'm not even really sure how helpful making an object would be. I mean you could create an object and associate the search options with it, but that's about all the information the object would contain. And it's not like imagesearch keeps a handle to the image file open or anything, so I can't see how performance could be improved. Maybe if you were using something like gdip_imagesearch() then there would be more optimization you could do using objects, but as far as I can tell, all that this would do for you would be to save you from inputting the options again. CountVar := ScannerObj.count(A_ScriptDir . "\assets\filename.png")      ; to "count", an imagesearch must be performed. Much more performance-efficient to count and test at the same time. ; If the count number is 0, using "count" does not take any longer so there is no penalty. I hope that makes sense. Or maybe I just don't fully understand what you mean. ... you can use the "w" (wait) option if you just want to wait for one image. The only reason I would use "count" there is if you are waiting for a certain number (more than one) of images to come up. If that's the case, keep doing what you're doing. Otherwise I wouldn't use "Count". I will say that it is probably more approachable as a function. The functionality I was talking has to do more with utility and perhaps my personal style than anything. Probably I just hate repeating the options over and over. Your tip on editing silent mode will help I bet. Is it possible to find the image, and have the function click a random spot on the image? FindClick("myimage", "x" RandX " y" RandY) ; if the image is found then it will be clicked with the random offsets specified. If that's not what you're looking for you could try the "Func" option. An example of that is given here. In that case it is using random speed but random location wouldn't be much different. (Side note: If your image is has even dimensions then the center is taken closer to the top left corner. E.g. if it is 4x4 there is no true "central" pixel so the center is taken as the second from the top and the second from the left). What is the advantage or some applications of clicking a random spot on the image rather than the default center of the image? Thanks berban for a great function. I already use findclick to make and crop screenshots but Is there a way to edit pixel colours of a screenshot or could this be added to findclick. It would be a very handy feature as I regularly make screenshots of text that has a semi transparent background which ends up being lots of different colours in the screenshot. I normally edit in photoshop and make background all black or white so I can use the transblack or transwhite function. 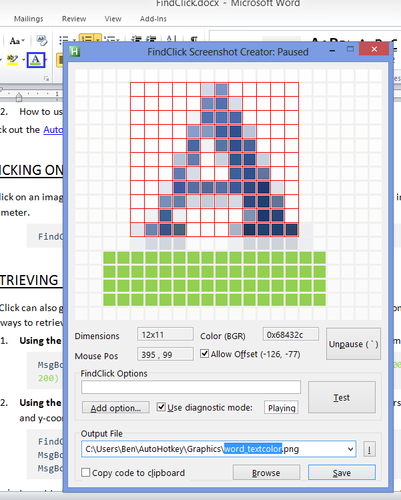 So it would be very handy if could edit the screenshot background colour in findclick instead of photoshop. Hey Darth_Diggler, I originally wanted to add something like that to the script but never got around to it. It would also have been pretty involved. So I guess the short answer is no I don't have that feature and am not planning on adding it unfortunately, sorry. Also personally I use mspaint for editing screen clips if I need to, that works fine, although I don't have photoshop so maybe that is better. Thank you so much for this excellent script, it's saved me heaps of time as well as looking after my wrists! I am having a bit of difficulty with the 'Wait until image is found' option however. It seems to be ignoring the total time to wait and endlessly looping until the image is found.